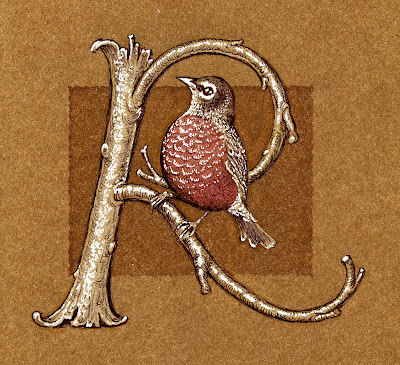 This week's entry for Ben Towle's Animal Alphabet goes out to my niece, Robin. Ball-point, marker & white gouache on brown paper, recolored & otherwise fooled with in Photoshop. Thank you Isaac! Unfortunately Dell has warned me to stop mashing worms into my computer or they will void the warranty. Heh I just read your reply to Robbin is Jokin very funny! What a wonderful work Leah, its gells in a very organic way, I am really looking forward to seeing your whole aphabet - very inspiring. I guess my Monday-blur lasted all week! Thanks, Andrew-- not sure if I'll backtrack & do A through I-- at least not until I finish my alphabet on Oddments-- I seem to have become alphabet-obsessed! Oh there is no rush, I enjoy illuminated manuscripts immensely and your work firs in so well, eh? I can't figure out how I was unaware of this other blog, since I visit your O&C blog so often! These are so wonderful!